Stack the cheese on the first slice of bread and place the second slice on top - buttered side up. Fry the sandwich until the bread turns golden. Grilled cheese sandwich tips and cooking options: While they are usually fried in a pan or on a griddle, Grilled cheese sandwiches can be cooked in a pan, on a griddle, on a grill/barbecue or on a sandwich/panini press. Grilled cheese sandwiches don't have to be made with cheddar (wonderful though it is). Mild (or medium) gouda makes a wonderful grilled cheese sandwich as does a Swiss Ementhal or any of your other favourite, firm cheeses. Deli rye is excellent for grilled cheese sandwiches too ... or try a fresh, home made french bread. Avoid very dark, hard, European style black breads as they will not fry properly. Thicker sliced breads or cheese may require some temperature/time adjustments as well. Some people like soft-ripened cheeses such as brie or camambert. We find soft-ripened cheeses too runny for sandwiches. If experimenting with soft-ripened cheeses, handle these sandwiches very carefully lest the hot cheese run and burn your hands. Aged, grainy or dry cheeses such as very old cheddars and Swiss emmental may not melt properly for grilled cheese sandwiches. Also known as a Toasted Cheese Sandwich, the grilled cheese has always been, for us, standard diner fare. 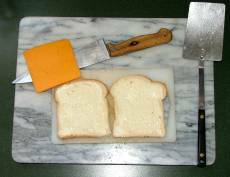 Almost any lunch counter or small diner would make great grilled cheese (squashed on a hot griddle) ... and almost always with processed cheddar cheese food slices - a food product made with real cheddar cheese. This processed cheese food product, while it melts nicely and doesn't fall apart or "separate" in the process, also contains extra salts (and other things) so we opt for real cheese. Our Basic White Bread Recipe @ FoodCult.com is pefect for this Classic Grilled Cheese Sandwich! Still, this diner/lunch counter sandwich, usually served with potato chips (crisps, for our English friends) and, often, a dill pickle was always an inexpensive, tasty treat. Making it at home is easy and this little treat lends itself to a variety of flavour options.